I almost apologized for posting another Bourbon recipe but I just cannot and will not apologize for this one, my friends. Because, maple, bacon, & bourbon. You know I love popcorn and as-of late, you know I love Bourbon. And so it goes in recipe brainstorming that you combine your favorite things. And together, your two favorite things just to happen to be the best popcorn recipe you’ve made to-date. I mean, by far, my favorite. It’s not even a contest. And I have a few favorite popcorn recipes. But this one, ladies and gents, is a sure-fire, life-of-the-party winner. The recipe and method is extremely similar to my maple-rosemary popcorn recipe, except with bacon and bourbon, rather than rosemary. I was thinking salted caramel + bourbon would be the ticket but at the last minute changed my mind when I ran across some pure maple syrup. I don’t absolutely love maple syrup, but then sometimes it’s the only answer. And let’s talk about the bacon. Don’t hate me for this – but I’m not bacon’s biggest fan. I never really have been. It’s not that I don’t like it. But I just don’t think of using it all too often. That is, until summer rolls around and I find myself craving BLT’s weekly. And a good summertime BLT is worth the whole house smelling like bacon. And so is this popcorn. 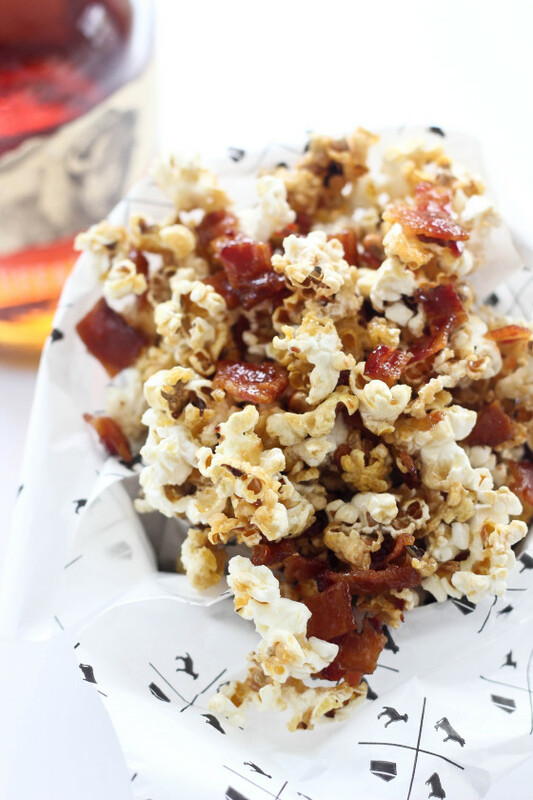 So craving a new popcorn recipe, and having bourbon in the cabinet, maple syrup in the fridge, and leftover bacon from some weekend BLT’s, Maple Bacon Bourbon Popcorn was born. It’s sweet, sticky, salty, and crunchy and simply, popcorn perfection. 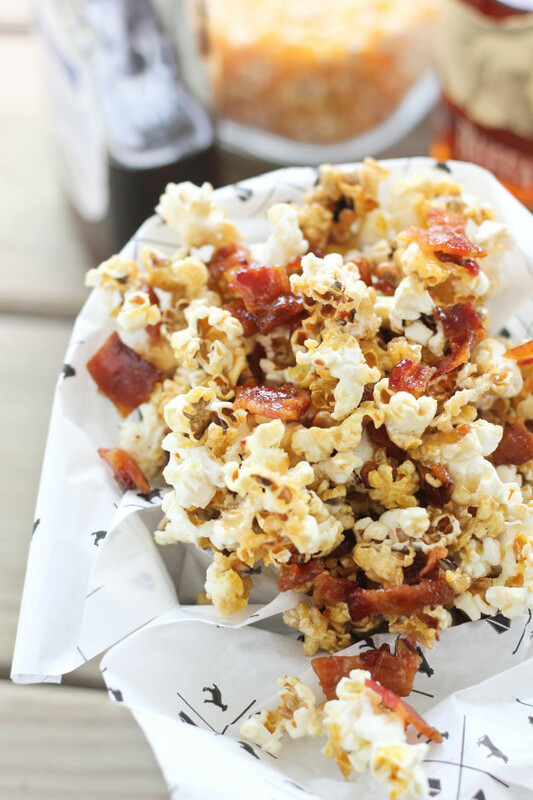 Sweet maple syrup, crispy bacon and good bourbon combine with popcorn for a sweet and salty snack! Add a few popcorn kernels to the pan, cover and let it heat up. When one kernel pops, add 1/3 cup of uncooked popcorn kernels and cover the pan. Shake the pan a little to spread the kernels in an even layer. Let the kernels pop for several minutes until the pan is full and the popping slows down. Remove from heat and transfer popcorn to a large bowl. Heat the oven to 250 degrees. Spray a 10x15 baking sheet with non-stick spray or line with parchment paper. When the popcorn is popped, spread into a single layer on the baking sheet. 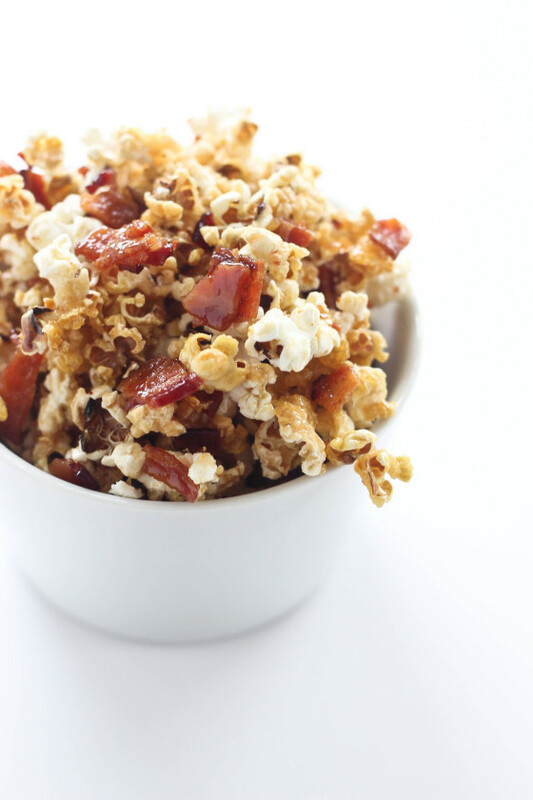 Dispurse the chopped bacon on top of the popcorn. Set aside. In a heavy bottom saucepot over medium-low heat, melt the syrup and butter together. Bring to a simmer, and continue to cook for 2-3 minutes, then remove from heat and stir in the Bourbon and sea salt. Pour over the popcorn/bacon mixture and stir to evenly distribute the syrup mixture. Bake in a 250 degree oven for 35-40 minutes, stirring frequently, until very fragrant and the syrup has started to harden. Remove from the oven and immediately toss. Transfer to a parchment-lined platter and break up any large pieces. Oh wait, no I don’t. Not at all. You definitely do not have to apologize. Because maple, bacon, and bourbon. Enough said!! 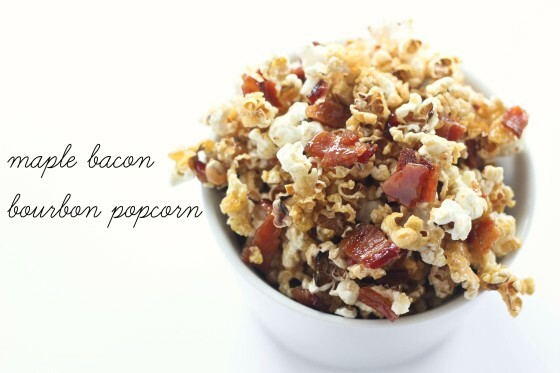 The fact that I can ACTUALLY see the bacon in this popcorn recipe has won me over. LOVE IT!!!!! I want 10 bowls of this!! Definitely no need to apologize for another bourbon recipe! I will be all over this sticky salty sweet popcorn! Oh my God, Cassie!!! You know I’m drooling, right?! Love this. Now that’s a power trio of ingredients if I’ve ever heard one. This would be dangerous movie watching fare. Girlll, never apologize for bourbon. This recipe is AMAZE! Never apologize for pairing bourbon and bacon – this is all sorts of fantasticness!! we’ve been making this for years–definitely one of our favorites but something I can only make occasionally otherwise I eat the whole batch! Never apologize for bourbon, especially when it’s mixed with Bacon! Just a quick note to let you know we are going to an outdoor movie tonight, and I will making this for our snack. Did not say how long to simmer. Guess I didn’t do it long enough as the syrup was very watery and even after baking for almost an hour, not very appetizing. I’m sorry this didn’t work out for you. The syrup mixture should simmer for 2-3 minutes (I updated the recipe.) If you are using a candy thermometer, it should reach 225 degrees. That will help the mixture set more. Thank you. I will try it again. Seriously. Bourbon. Bacon. Maple. Popcorn. That pretty much covers the 4 main food groups. I think 1 recipe will not ne enough for the Oscar party we are attending! How do you stir frequently if the popcorn is in a single layer on a baking sheet? Made this tonight. Soooooo good. Only comment is that I used a candy thermometer to get to 225 degrees but it took over 10 minutes to get there. I also used half a cup of popcorn instead of a third but didn’t increase any of the other ingredients. The results were addictive! Three of us, one recipe – not enough popcorn! It was outstanding. This sounds DELISH!! Can you use popcorn that is already popped (buy a bag of popcorn)? Kisha, I have never tried that, but I’m guessing it would probably work. The popcorn might not be as fresh, but I wouldn’t know why it would not work. Enjoy! How far ahead can this be made? – trying this for Bunco night, thought it would be a little different, but don’t want to be standing over oven waiting to finish night of event. Hi Marci, I wouldn’t make this more than one day in advance. I liked it the second day, and everyone at my office did as well. But after the second day, it might taste soggy and stale. I hope you enjoy! delicious! Note, you’ll need to heat the liquids to 275 degrees (use a candy thermometer) to get the syrup to the right consistency. Hi Nancy, I had no problem with it sitting overnight in an air-tight container with no refrigeration. But if you are nervous about the bacon going without refrigeration, I would suggest trying to make it the day-of, or refrigerate overnight, and then bring to room-temperature for a little while before serving. Enjoy! This is a great, if dangerously addictive snack. I never made popcorn before, outside of microwave bags and Jiffy Pop when I was 8, so I was surprised at how easy it was to make and it was delicious all on its own. Unfortunately I did not have any Bourbon on hand, my favorite being Buffalo Trace as well, so I used Jameson’s instead. Bourbon has such a distinctive flavor, that I can see it making a difference, although it came out great anyway. I was thinking I might try Southern Comfort next time though. Also I would suggest using good bacon. I mistakenly bought cheap fatty bacon, and it didn’t cook up right, basically fried fat, and it doesn’t hold up as well during the second baking. Anyway, loved this and will definitely make a huge batch for my next event. I’m so glad you liked it! We usually have Jameson on hand as well (that’s one of my husband’s favorites) so I will try that next time. I bet Southern Comfort would also be great because it is so sweet! Thanks for the comment, Jennifer! Pingback: The Good, Bad, and the Strange | foodiejournalism.